As we arrived inside the store we were greeted with many lovely Lush helpers who were ready to grab groups of us and show us all the new products! We also had a lovely flute glass of something sparkly with blueberries. Lowri decided to take us 5 on and show us around! 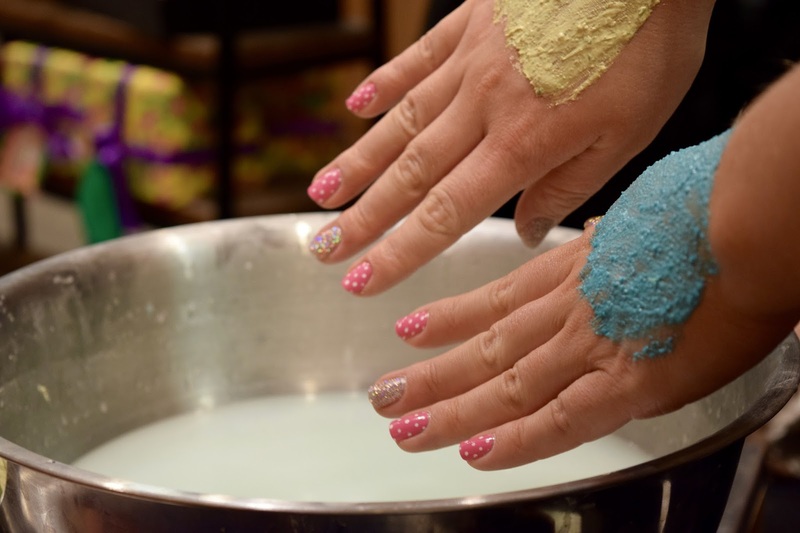 We started with bath bombs and after checking out the cute easter egg style bath bombs we were then covered in glitter by the 'Golden Egg' bath melt! No, seriously that gold glitter got everywhere! 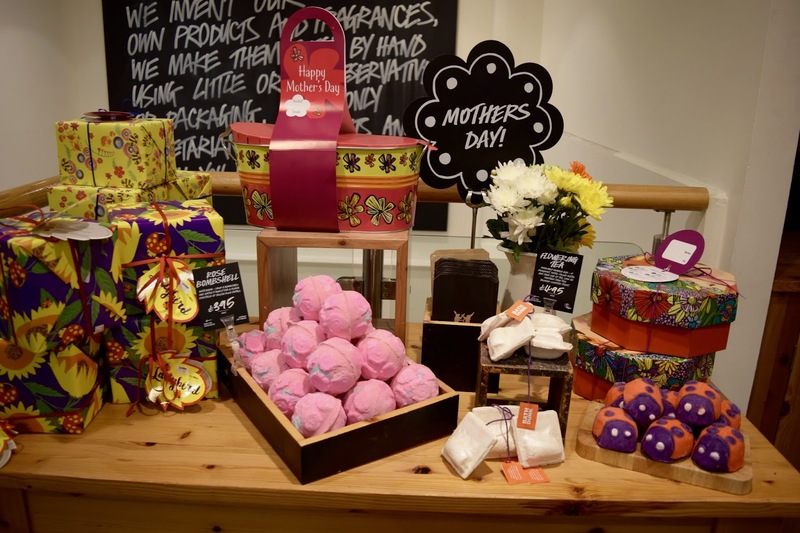 Then we had a chance to look at the Mother's Day range. In my thoughtful lil goodie bag I received two of the bath bombs from this range which were 'Ladybird' and 'Rose Bombshell'. 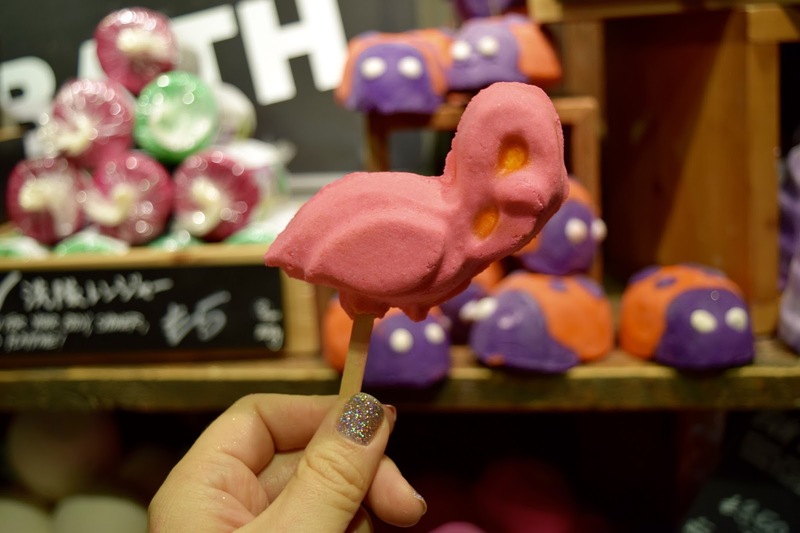 I am yet to use either of them but after seeing and smelling both of them at this event I can tell you that the 'Ladybird' bubble bar is pepperminty and the 'Rose Bombshell' is obviously very floral and has rose petals in it which, if I remember correctly, Lowri said were handpicked. After browsing downstairs a little bit we then moved upstairs. We first looked at the massage bars. I've used there before and not for massaging! I actually love their scent ('Soft Coeur' in particular for it's toffee goodness) and use them as a moisturiser because I can smell it on my skin all day! A few of the girls had their arms massaged and then we moved onto make-up. I don't think any of us had used their make-up range before so it was all new to us. After watching the demonstration of the foundation I would definitely think about purchasing it in the future. We also had a look at the lipsticks which were gorgeous and handy to know that they could be used anywhere on the face. Lip products can sometimes be great to use as a cheek stain! Finally, we looked at face masks. Last week for some reason my skin was not my friend! I had many spots which I rarely have considering I have dry skin and they were not budging! I wanted a mask to calm my skin down and balance it out. 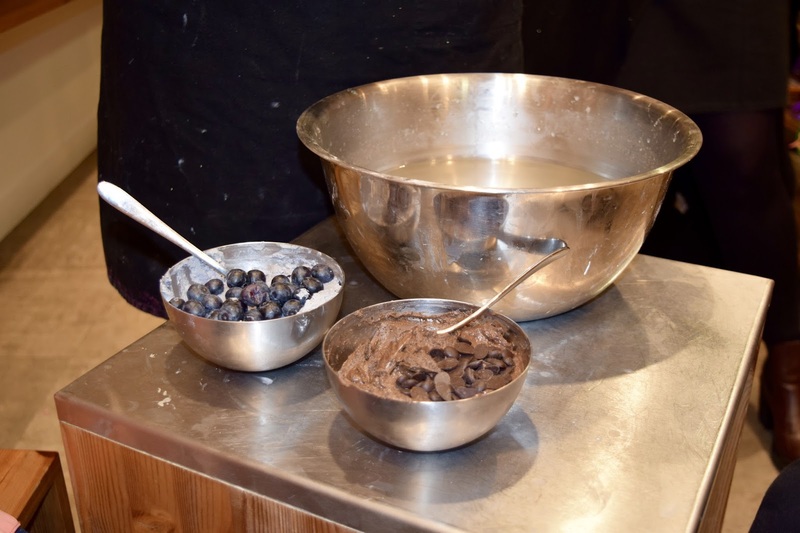 As a group we tested out 'Cupcake' a chocolatey, minty mask for drawing out the dirt deep within your skin and 'Cosmetic Warrior' a garlicy, very natural smelling mask for cleansing and moisturising. I wanted to purchase my first mask and Lowri recommended that I tried 'Catastrophe Cosmetic'. A calming mask with blueberries and chamomile which would be great for soothing my skin and getting rid of those spots which had decided to set up shop on my chin. It is now Saturday and I have used the mask twice. This morning I used it whilst in the bath after exfoliating with 'Cup o' Coffee' and left it on for around 10 minutes. I never normally use a mask or scrub in the morning if I am going to wear make-up later on in the day just because I like to let my skin breathe. However, I was teaching dance today and I wanted to make the most out of this mask. Honestly, I couldn't even feel any make-up on my skin all day! I have sensitive skin and if you have tried 'Cup o' Coffee' exfoliating mask you will know that it is not an every day mask/scrub but this blueberry and chamomile magic mask just calmed and cooled my skin down immediately. I had such a good time and everyone was so welcoming and friendly. 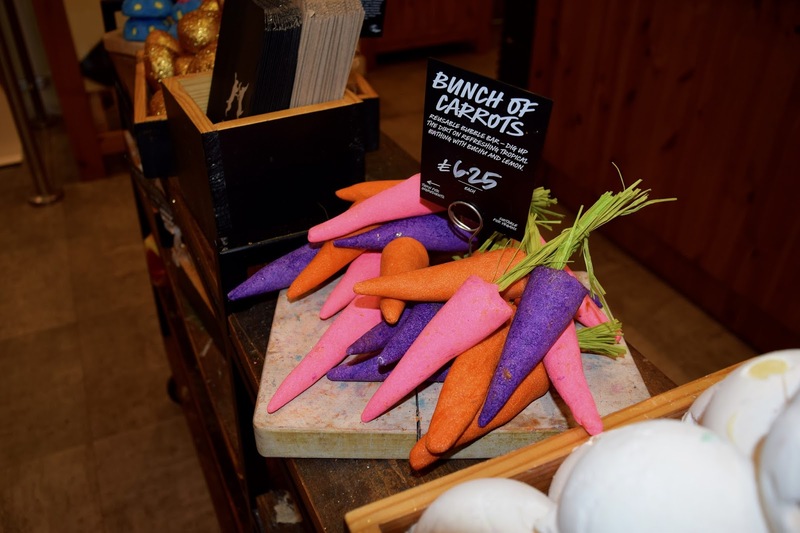 I wouldn't say that it is a relaxing and calming event, it is filled with bubbles, glitter and laughs as well as a multitude of smells but it was definitely exciting and reassured me that Lush is a great place to spoil yourself with staff who are well educated in all their products and ranges. 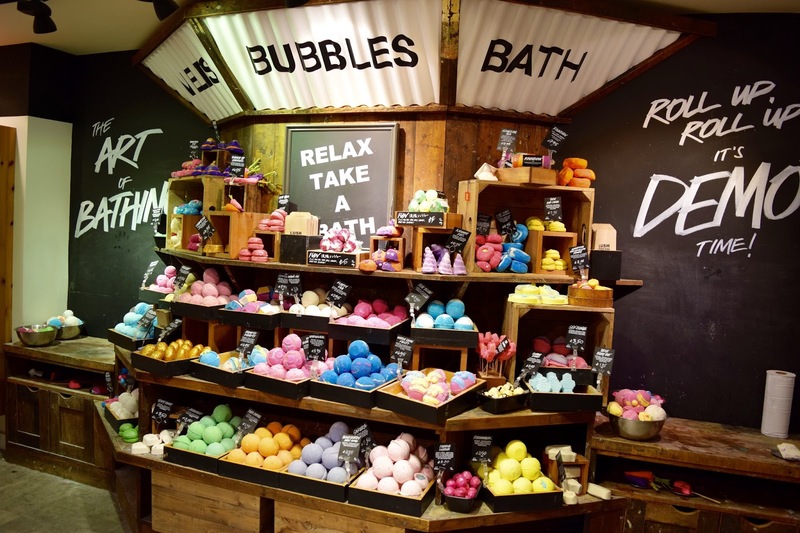 Thank-you for having me Lush Cardiff, you have a great team and I can't wait to see you again soon!